Abandoned children are a common view on the streets in many African countries, where a multitude of social, economic and cultural circumstances might force a parent to abandon his or her child. 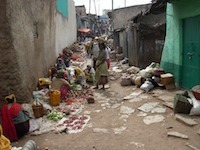 In Africa, many children live under harsh conditions of extreme poverty and lack the opportunity for a dignified life. More than 10 % of African children were estimated to die before they reach the age of 5 years. 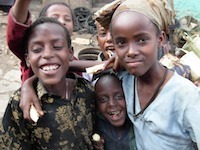 The situation is particularly difficult for abandoned children who are deprived of family care. In Khartoum (Sudan), every day about 5 children are abandoned by their parents, a number that is expected to increase in the future. This puts a lot of pressure on the already strained homes that currently provide accommodation for these children. The Maygoma and Sajjanna orphanages in Khartoum currently house hundreds of abandoned children. BTA currently prepares a project with the aim of offering assistance to the homes of abandoned children through a program where volunteers will assist in the care of the children. The program is expected to facilitate the exchange of knowledge between these volunteers and their Sudanese counterparts. The project furthermore aims to provide material aid to the homes through donations and - in the long run - a sponsorship program. We will also work towards raising awareness, locally and internationally, of the situation of abandoned children in Africa and towards a more permanent solution by tackling the social issues which lead to abandonment of children. For further information, please contact the project leader Adila Elobeid (email: children@bridgetoafrica.se).